You are currently browsing the tag archive for the ‘Native American issues’ tag. Something’s happened over the past few months. 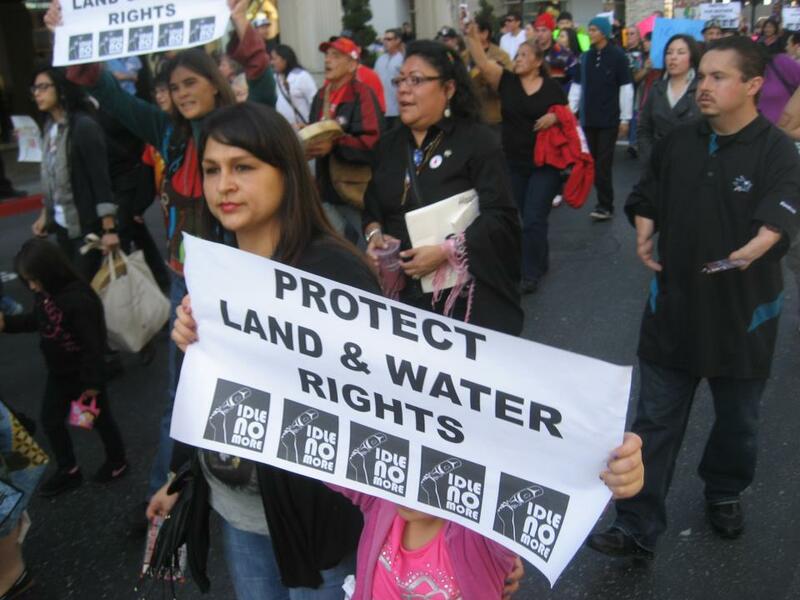 Protests have sprouted up literally around the world with signs much like those in the photo below (taken in San Jose in JIt’s a Native Canadian (referred to as “First Nation” in Canada) movement recently arising as a resistance to a series of bills initiated by Canada’s Conservative government. Although the “leadership” can traced to the initiative of a handful of women, it’s organization – such as it is – is decentralized so that it’s drawing comparisons to the Occupy Movement, and drawing similar criticisms from its detractors. It began with omnibus Bill C-45, essentially intended to gut the Navigable Waters Protection Act (NWPA) of 1882 – including the name itself (It will be referred to as the Navigation Protection Act (NPA)). What the NWPA did was require a rigorous approval process, which included First Nation input, before any major development could take place on national waterways. In mind was apparently clearing way for the Enbridge Northern Gateway pipeline. The “NPA” limits the process to a specific list of lakes and rivers, leaving a significant amount of new waterways (that are largely on Indigenous lands) vulnerable to expanded industrial development and environmental damage. These bills are a focus, but not the sole focus. Really it’s about the process Harper’s administration took, which was to essentially bypass even what passed for a process of communication in order to muscle through some “reforms” being pushed by some very strong lobbies, within Canada and without. The movement began with a teach-in involving activists Nina Wilson, Sheelah Mclean, Sylvia McAdam and Jessica Gordon in November 2012, in Saskatoon – the name of the event being “Idle No More.” But credit may also go to one Tanya Kappo who twittered the concept as early as November. And Chief Theresa Spence initiated a hunger strike aimed at a dialogue with Stephen Harper, but her effort actually underscores the first division within the movement as it is primarily focused on winning hearts and minds – educating and impacting the general political climate – not aimed at a specific legislative or in-system strategy. The Conservatives have employed Native members of their ranks to discredit the movement, pointing out that some of the “reforms” proposed are supported by some Native leadership (including some elements of the Assembly of First Nations), and they criticize the movement for extra-parliamentary system tactics and a lack of focus. But again, the point of the movement is education and revitalization, leaving the Realpolitik to other efforts. The proposed legislation was the trigger, but not the whole point. The Conservatives certainly understand this, or they wouldn’t be taking so much trouble to discredit Idle No More. What is amazing is that without centralized organization, solidarity protests have sprung up throughout Canada, the United States, Latin America, Europe, and even Egypt. And in most places, the efforts are adapting the “flash mob” tactics, involving chants, music, and a very upbeat tone despite the very serious issues involved. The photograph above was taken by INM supporter Carole Flynn at a solidarity demonstration in San Jose last month. It’s hard to judge the effectiveness of a movement like this one, as it doesn’t necessarily result in the passage or defeat of a certain bill, and as with the Occupy movement the gain can seem intangible until the talking heads have their say. But even they acknowledged that Occupy may have turned the climate around to be a serious factor in Obama’s win, or at least Romny’s defeat. Right now, the INM protests are being credited for having forced extensive dialogue between the Canadian government and First Nations leadership – a good thing although INM voices have been very critical of the First Nations on many different levels. And there are internal disagreements about strategies and tactics, and probably even some ego/power struggles, which will be played up by the media. And there are inconsistencies. And there is garbled messaging. And I’m sure all the usual suspects of sectarians and pols will rush to jump on the coattails and take credit where they can. And while INM activities are in a lull since February, the media will probably try to write its epitaph, just as they did to the Occupy Movement on a weekly basis long before it petered out. But there is also drive, energy, and focus. And there is optimism – for the first time in a long while. INM may not sustain itself in present form indefinitely, but I expect it will ebb and flow furiously for some time. Already, even well-intentioned progressives are feeding into the potential meme of the movement as a flash-in-the-pan, but Google news “Idle No More” and you’ll find that there’s plenty of activity whether it’s getting national or international coverage. Not much coverage in the US media just yet, but plenty in the Canadian media. Lots of youtube videos, including this collage of the issues and events leading up to the first protests. It spread like wildfire by word-of-mouth. I first heard about it from a friend, not the media. That it spread internationally so quickly indicates a very strong grassroots presence. The Canadian government is right to be afraid. Neely may have replaced our man Rodoni on the HCAOG Board, but as mayor Virginia Bass has also replaced La Vallee, and so far will not vote for Hoopa admission. Why didn’t anybody see that one coming? According to the Times Standard article, the “conservatives” on the Board won’t vote to allow Hoopa membership until there is some kind of agreement on the part of Hoopa that they will forgo and future campaign contributions to offices which result in HCAOG membership. According to the new rules up for consideration, new members would have to have public agency status, a population greater than 300 and a road system greater than five miles. They’d also have to agree to all statutory and regulatory requirements of any grants project delivery processes, and they’d have to conduct all HCAOG related business. American Indian governments would have to agree to a waiver of limited sovereign immunity for interpretation of the HCAOG cooperative agreement. While tribal nations do not enjoy direct access to U.S. courts to bring cases against states, as sovereigns they do enjoy immunity against many lawsuits (Santa Clara Pueblo v. Martinez, 1980), unless a plaintiff is granted a waiver by the tribe or by congressional abrogation (Oklahoma Tax Comm. v. Citizen Band Potawatomi Indian Tribe, 1978). The sovereignty extends to tribal enterprises (Local IV-302 Int’l Woodworkers Union of Am. V. Menominee Tribal Enterprises 1984), and tribal casinos or gaming commissions (Barker v. Menominee Nation Casino, 1995). The Indian Civil Rights Act does not allow actions against an Indian tribe in federal court for deprivation of substantive rights, except for habeas corpus proceedings (Santa Clara Pueblo v. Martinez, 1978). But it cannot be merely implied. Hoopa would have to make the intent very clear. Absent “a clear waiver [of immunity] by the tribe or congressional abrogation”, Oklahoma Tax Commission v. Citizen Band Potawatomi Indian Tribe of Oklahoma, 498 U.S. 505, 509, 111 S.Ct. 905, 112 L.Ed. 2d. 1112 (1991), it is clear that Indian tribes possess the “common law immunity from suit traditionally enjoyed by sovereign powers.” Santa Clara Pueblo v. Martinez, 436 U.S. 49, 58, 98 S.Ct. 1670, 1677, 56 L.Ed. 2d. 106 (1978). The sovereignty of the Mohegan Tribe of Indians of Connecticut is further expressly set forth in the Mohegan Constitution, which provides that the Tribe shall have all the inherent sovereign rights and powers of an independent, indigenous sovereign nation. Mohegan Const., Art. II. While Indian Tribes can waive their sovereign immunity, “such waiver may not be implied, but must be expressed unequivocally.” McClendon v. United States, 885 F.2d. 627, 629 (9th Cir. 1989). “The issue of tribal sovereign immunity is jurisdictional in nature.” McClendon v. United States, Id. “Where there is any doubt about [the] meaning or intent [of the statute in derogation of sovereign immunity, it is] given the effect which makes the least rather than the most change in sovereign immunity.” Federal Deposit Insurance Corp. v. Peabody, N.E., Inc., 239 Conn. 93, 102, quoting White v. Burns, 213 Conn. 307, 312 (1990). There are cases in which what appeared to have been clear waivers were held as procedurally and/or jurisdictionally void for their lack of clarity, as illustrated in the above-linked case. During the 1980s there were hearings to revisit the whole “Red Atlantis” program of quasi-sovereignty (it’s not really sovereignty if congress retains the power to revoke it and manage it). Unfortunately, Sen. Orin Hatch opened his mouth and many of the tribal leaders assumed that there was an agenda to expand Mormon adoptions of native children – a major issue of bitter contention between the tribes and the church. Nothing came of the hearings. Meanwhile, if anybody on the HCAOG board is reading this, I want to register my support for a Eureka-to-Arcata bike trail along the old railroad track line. That’s up your alley, isn’t it?